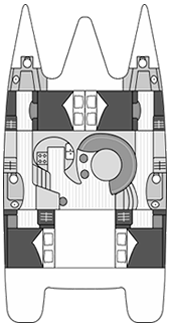 This generously proportioned four cabin, four head layout has the added bonus of a generator and air conditioning for superb comfort in the cabins and salon. With top of the range appliances in the spacious galley you can cook as if you were at home. Her convivial saloon, good ventilation and excellent visibility make her a privilege to sail. Sail Area: 1195 Sq Ft.